As I've mentioned on the blog before, Master of Malt run a fantastic sample service called "Drinks by the Dram", with literally hundreds of drams available at very reasonable prices. They're based in the UK, and their shipping costs aren't too friendly unless you're buying a few full-size bottles too (or a LOT of samples), but it really is a great way to try a special dram without forking out hundreds (or thousands) of dollars for a bottle. From Southern Comfort to a 1958 Glenfarclas, if you're keen to try something, it's worth checking out. I've found generally the prices are much better than ordering similar whiskies at Australian bars (if you can even find the whisky at a bar). I'd been keen to try their 50yo for a while (see tasting notes here), so figured I'd give the 40yo a go too (a ful bottle is $445AUD but the sample is only $22 or so). 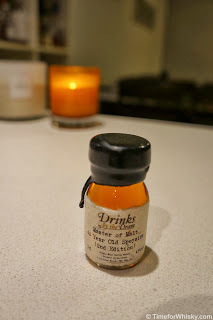 In the interests of being mysterious (and you know, probably protecting the original distillery's reputation and whatnot), Master of Malt don't mention the distillery from which the 40 and 50yo drams come, except to say they're Speyside single malts. I really don't know which distillery this came from, nor will I take a guess, though they do call it a single malt so it's not from a teaspooned* cask (so unlikely to be from Glenfiddich or The Balvenie, who are known to teapsoon the majority of casks they release externally). Colour: Rich copper - not overly dark, but not dissimilar to other 40yo whiskies around this strength. Nose: As I was expecting/hoping for - complex, with the expected leather and oak notes, but also sesame seeds and fresh laundry! Palate: Lighter than the nose suggests. Slightest hints of smoke give way to tangy orange notes, and some residual oak (though not so oaky that I felt like I was chewing an oak stave). Finish: Oaky and long, but with none of the complex notes I've had on other similarly-aged whiskies. Reminds me of a Glenfiddich 30yo. Rating (on my very non-scientific scale): 92/100. An enjoyable dram, but I wouldn't rush out and buy a bottle at $445AUD. * "Teaspooning" is when a small measure of one distillery's malt whisky is added to a cask of another, effectively making the whisky a blended (or vatted) malt, and no longer a "single malt". Typically done to protect the reputation of distilleries who are putting their casks out there on the market for blenders / independent bottlers. If anyone ever comes across a "Burnside" (Balvenie with a dash of Glenfiddich) or "Warhead" (the reverse), please let me know! I've yet to encounter a "Warhead" but I do happen to own a bottle of "Burnside." Or rather the 1991 John McCrae 24 Year Old "Hepburn's Choice" Single Barrel that K&L Wines in California was selling last year. I haven't opened the bottle yet but I was told this whisky was both drier and lighter than official bottles of Balvenie.